Involve Syria and Iran in the Lebanon War? See an online streaming video of this program. LOU DOBBS, ANCHOR: I'm joined now by three of the country's leading authorities on the Middle East. Here with me in our New York studio is Daniel Pipes, director of the Middle East Forum, an authority on radical Islamist terrorists and the Middle East. And Alon Ben-Meir, an esteemed professor at NYU's Center for Global Affairs, good to have you with us. And joining us from Washington, Karim Sadjadpour, a highly regarded Middle East analyst with the International Crisis Group. Good to have you with us. Let me begin Karim, first of all, you believe, although the president and others have said they're going to turn to Damascus for help with Hezbollah, you believe that we should be turning in a different direction? KARIM SADJADPOUR, INTL. CRISIS GROUP: Well, Lou, I think essentially we have an alliance between three entities. We have the Islamic Republic of Iran, we have Syria and we have Hezbollah. And I think the Israeli strategy, you know, Israel refers to Hezbollah as a cancer, but what they've been doing is using a chemotherapy to fight that cancer which is essentially been destroying the body of Lebanon. We have one million displaced people. We have about a thousand civilian casualties, and what I would argue is instead of chemotherapy, let's try cancer prevention. Let's talk to Syria. Let's talk to Iran and try to prevent these weapons from even going to Hezbollah in the first place. DOBBS: Alon, do you agree? ALON BEN-MEIR, PROF. CTR. FOR GLOBAL AFFAIRS, NYU: Well, I think, in principle, Syria ought to be engaged in this process. Syria has very unique interests and like Iran, who is interested in disturbing, disrupting the Israeli/Arab peace process, but Syria has the claim over the Golan Heights and as long as the Syrians don't see a way of getting that, they will continue to cause trouble as best as they can. 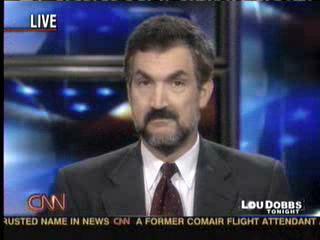 DANIEL PIPES, DIR., MIDDLE EAST FORUM: Well I agree that Syria should be addressed, but I'd put it a little differently. I think rather than going to them and pleading with them to be nice and not to allow weapons, arms and personnel and funding to Hezbollah, we should be telling them you better not or you, as opposed to Lebanon, will be the target. DOBBS: It strikes me tonight that Israel looks very weak here. Israel has not been able to subdue Hezbollah. The United States, engaged as it is in Iraq, seems to be offering platitudes and some rhetoric talking about there will be no cease-fire unless it's sustainable and addresses the root causes of the conflict, that we know right now in the United Nations diplomatic efforts are under way to get a cease-fire—almost—there's almost a desperate drive to a cease-fire. Karim, let me ask you, would you agree with that assessment, and what are its implications if that's the case? SADJADPOUR: Well, I'm actually more hopeful about the prospects of a cease-fire in the next week or so. I think the Israelis don't want to be in a situation where they're again occupying Lebanon. They've made it very clear, they tried that for two decades, it wasn't successful. At the same time, the Lebanese public is really desperate, very much fed up, and I think Hezbollah does not want to continue this either. I think the holdup right now is between the argument that this should be a robust international peacekeeping force, which comes into play, or the Lebanese argument, which says that—the Lebanese army itself should play the peacekeeping role. I think this should not be held up for too long. Hopefully, we can find a medium solution in between those two. BEN-MEIR: I absolutely think that Israel, you know, from the very beginning, suggested it has to have a clear-cut victory, and now they're talking about clear-cut sort of decisive result. What does that really mean? I think Israelis absolutely believe that Hezbollah has to be broken, has to be disarmed one way or the other, and anything short of this type of outcome is going to seriously backfire against the current government once this crisis is over. PIPES: Israel's glorious days of victory are long gone. Since 1973 -- since 1973, which is now over 30 years ago, the Israelis have not had a decisive victory. Indeed, the most parallel case to the present is 1982, when the Israelis took 88 days to defeat the PLO. So this is actually in keeping with modern—with current Israeli history. DOBBS: With the United States engaged in what is by I think a reasonable definition an outright civil war right now in Iraq, with our troops consumed there, with our policy, where not vague it seems to be ineffective, foreign policy. What are the implications for U.S. policy and for Israeli policy in the Middle East, given what seems to be agreement here on the constraints on both Israel and the United States? PIPES: Some have compared this, and I think reasonably, to the Spanish civil war as a precursor to World War II. It was the same actors, but it was a side show. In some sense, having Israel and Hezbollah in Lebanon are a precursor or a side show to the United States and Iran. BEN-MEIR: But there's a larger thing. I think initially, when you saw the Arab states, specifically Saudi Arabia, Egypt, Jordan, pretty much they were mute about what Israel has been doing. So I think there's also the larger picture we have to look at, and that is the fight, the conflict between the Sunni and the Shia. For many Arabs, they see what's happening in Lebanon, and to some extent it served their interest, they wanted to see Hezbollah broken. But because of what's happened, because of the Israeli bombardment of some of the Lebanese—you know, in Beirut, the public opinion has shifted somewhat. But I think we have to also look at the larger picture. There is a definite interest in seeing Hezbollah broken and disarmed by not just Israel—by the United States, certainly, but also by moderate Sunni Arab states. To them, this is a critical point. DOBBS: Karim, you have the last word. About 15 seconds worth, if you will. SADJADPOUR: What I'm concerned about, Lou, is that when you're reading the Iranian press, they describe this as a battle for the future of the Middle East, for the future of Muslim and Arab hearts and minds, and they feel they're very well placed, that Iran's type of politics in the region is on the ascent, Hezbollah in Lebanon, Hamas in Palestine coming to power, and the secular democrats, the reflection of the United States, are in decline. So I think we need to be very much concerned about the future of the Middle East. DOBBS: I think we should be concerned indeed. I think just about everybody would agree with you, Karim. We thank you very much, Alon, Daniel, thank you all for being here. Appreciate it.